Cook pasta al dente according to package instructions and drain. Meanwhile, lightly rub chicken with olive oil. Season with salt and pepper if desired. In a large skillet over medium high heat, brown chicken for 5 to 6 minutes on each side, or until an internal temperature of 165°F is reached. Remove chicken from skillet. Allow to rest for 5 minutes and cut into thin strips. Meanwhile, in a small saucepan over medium heat, warm Pasta Sauce for 4 to 6 minutes, or until heated through, stirring occasionally. Add broccoli and cooked pasta, and stir until well coated. 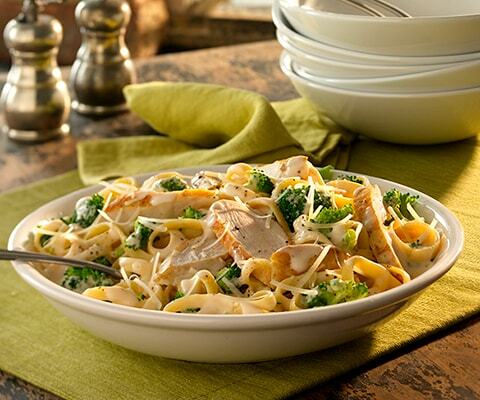 Top with chicken strips and Parmesan cheese. Serve immediately. For added flavor, add 1 Tbsp. of chopped fresh basil to olive oil rub. If desired, substitute Classico® Four Cheese Alfredo Pasta Sauce with Classico® Creamy Alfredo Pasta Sauce. I added some cayanne pepper and black pepper while cooking the chicken. Came out very good. This came together so quickly. I had already cooked several chicken breasts earlier this week. So, all I had to do was cook the pasta and broccoli. I used penne and it worked well. Also, I added more broccoli. Before serving I topped it with some Italian Panko bread crumbs! YUMMY!!! This is now saved in my favorites for future use! I tried this once, & haven't bought another. I use the "4"-Cheese Alfredo pasta sauce. I would like to add diced tomatoes, has anyone tried this?